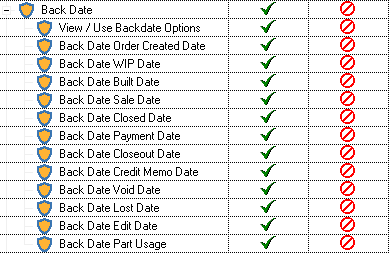 In the list of Accounting Setup “pages”, Control provides an option screen which permits authorized users to backdate the Order Create Date, Built Date, Sale Date, Closed Date, Payments, Edits, Close-Outs and Credit Menus. 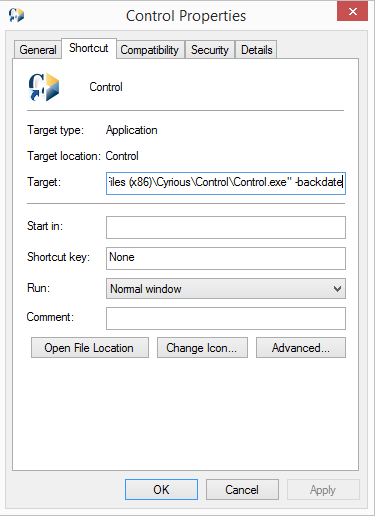 Unless the proper entries in certain Control files are made, this option does not appear in the list. This “How To” describes how this screen is made visible and available. Cyrious is designed to be a real-time estimating, invoicing, and production system. As such, the current date and time are almost always used for activity in those areas. There are times, however, when it may not be possible to record activity at the time in which it occurs. Backdating provides a mechanism to prompt the user for the date and time in which to record order entry, order status changes, and payment entry. Note: This is only available for users who are not part of a franchise. There are several cautions related to back-dating. Cyrious recommends this option NOT BE USED if it can be avoided. It has been our experience that non-accounting staff (which exist in every business) do not usually fully grasp the accounting ramifications of back-dating into past periods. The result can be over or under-reporting of sales, payments, and general chaos! Again, if this option is enabled it should only be allowed to skilled accountants. Cyrious does not restrict posting into previous periods. Doing so will alter the financials for the previous period and NOT show up in any current income and payment reports. Most franchises do not allow this option and it may be disabled for them. Right-click the shortcut for Control and choose Properties. Log into Control with a user that has administrator rights. 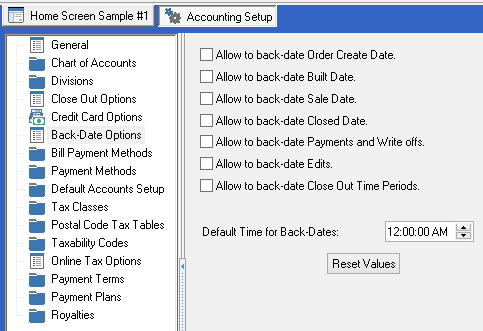 Click on Setup > Accounting Setup > Back-Date Options. Enable the events you wish to allow back-dating on. Set the Default Time for Back-Dates. I recommend setting this for a time in your normal business day, like 4:00 PM. If you wish to allow certain non-administrator users to back date you can do so by adjusting the security rights for their security template. Click on Setup > Security Setup. Expand the Back Date section. Adjust the rights as you desire. These changes will take effect upon next logon for the user. 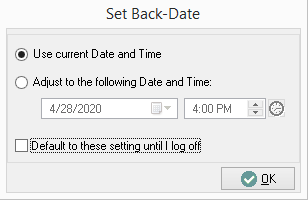 When you perform one of the events that you enabled backdating on you will be prompted to specify the date as shown below.